Definition at line 71 of file RDFRegisters.h. Definition at line 76 of file RDFRegisters.h. Definition at line 79 of file RDFRegisters.h. Definition at line 87 of file RDFRegisters.h. Definition at line 91 of file RDFRegisters.h. Definition at line 83 of file RDFRegisters.h. Definition at line 73 of file RDFRegisters.h. Referenced by llvm::rdf::Liveness::computeLiveIns(), llvm::rdf::Liveness::computePhiInfo(), llvm::rdf::PhysicalRegisterInfo::getAliasSet(), llvm::rdf::RegisterAggr::hasAliasOf(), llvm::rdf::RegisterAggr::hasCoverOf(), llvm::rdf::RegisterAggr::insert(), llvm::rdf::PhysicalRegisterInfo::mapTo(), operator<(), operator==(), llvm::rdf::DataFlowGraph::pack(), llvm::rdf::Liveness::resetKills(), llvm::rdf::Liveness::resetLiveIns(), and llvm::rdf::DataFlowGraph::restrictRef(). Definition at line 72 of file RDFRegisters.h. 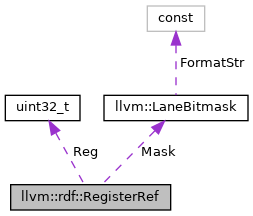 Referenced by llvm::rdf::PhysicalRegisterInfo::alias(), llvm::rdf::Liveness::computeLiveIns(), llvm::rdf::Liveness::computePhiInfo(), llvm::rdf::PhysicalRegisterInfo::getAliasSet(), llvm::rdf::DataFlowGraph::getNextShadow(), llvm::rdf::RegisterAggr::hasAliasOf(), llvm::rdf::RegisterAggr::hasCoverOf(), llvm::rdf::RegisterAggr::insert(), llvm::rdf::CopyPropagation::interpretAsCopy(), llvm::rdf::PhysicalRegisterInfo::mapTo(), operator<(), operator==(), llvm::rdf::DataFlowGraph::pack(), llvm::rdf::DataFlowGraph::pushAllDefs(), llvm::rdf::Liveness::resetKills(), llvm::rdf::Liveness::resetLiveIns(), and llvm::rdf::DataFlowGraph::restrictRef().